Guns, money, and and lawyers; the first two items are what this disjointed story from CBP is about, and the last is what the 3 people involved in this cash and firearm seizures by CBP will need. Customs seized $20,000 outbound to Mexico which resulted in an arrest, another $38,000 that probably (but not certainly resulted in an arrest), and a a cache of guns and ammo. U.S. Customs and Border Protection officers conducting outbound inspections at Arizona’s Port of Lukeville arrested two Mexican nationals Tuesday after finding unreported U.S. currency, weapons and ammunition in separate seizures. Officers referred a 27-year-old Mexican man for a further search of his Dodge sedan Tuesday night and found more than $20,000 in unreported U.S. currency within the vehicle’s center console. This is the second unreported currency seizure this week. On March 11, Lukeville officers prevented $38,000 from being smuggled into Mexico. At about the same time, officers referred a 43-year-old Mexican woman for a secondary inspection of the Dodge truck she was driving. That search turned up multiple firearms and associated accessories to include several assault rifles, a handgun, multiple ammunition magazines, two weapon scopes and approximately 6,000 rounds of ammunition. CBP has been busy seizing cash across the country, and that is the reason my customs law blogging activity has slowed down in recent weeks. For the many readers of this blog who like these posts, I apologize. I’ll be trying to return to more frequent blogging in the next week or so. It seems CBP has also been too busy to make many news releases about the seizure activity, too. But, today, we have word of a pretty huge seizure of $211,000 in cash being seized from a Mexican national while leaving the United States. 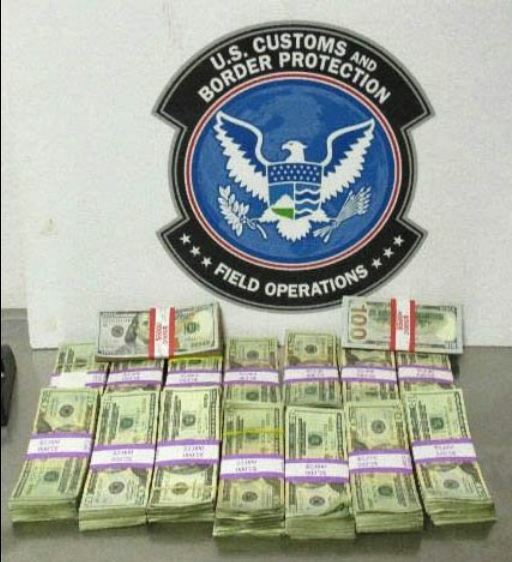 Customs and Border Protection officers at the Mariposa crossing in Nogales, Arizona, arrested a Mexican national Friday for attempting to transport almost $211,000 in unreported U.S. currency. CBP seized cash from a Mexican heading back into Mexico on March 2. The cash was hidden in a cooler located in the passenger compartment of his vehicle, underneath some food and ice. This is definitely a case of “unreported currency” but, more accurately, it is also likely bulk cash smuggling. CBP seized the cash for presumably failure to report and bulk cash smuggling. A male Mexican national was arrested Wednesday (March 2) for attempting to smuggle slightly more than $95,000 in unreported U.S. currency into Mexico through the Port of Lukeville. U.S. Customs and Border Protection officers conducting outbound inspections selected a Chevrolet truck driven by a 45-year-old Mexican national for further inspection. During the search, officers found an ice chest between the front seats concealed compartment containing three packages of U.S. currency hidden beneath ice and food items. The cash was seized. The case have been referred to U.S. Immigration and Customs Enforcement’s Homeland Security Investigations for further investigation. The story doesn’t explicitly state that the seized cash was connected to drug trafficking, but in my mind, behind any suspicious movement of cash across the southern border looms the large shadow of the illegal drug trade. CBP seized the cash is investigating the entire situation. Has CBP seized cash from you? The process of getting money back from CBP is long and complicated; most importantly, legitimate source and intended use must be proven. If CBP seized cash from you, you can learn more about the process from our trusted customs money seizure legal guide and can contact us for a free currency seizure consultation by clicking the contact buttons on this page.